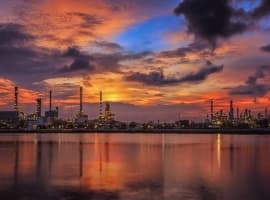 Crude oil and gasoline futures are set to finish the week in strong positions as investors continue to bet on a positive outcome from talks regarding a production freeze. Both markets are being driven by tremendous momentum with very little concern about the traditional supply/demand numbers. This is clearly a sign that the market is focused on the future and not the now. In the natural gas market, the strength from earlier in the summer just doesn’t seem to want to go away as buyers continue to bet that the inventor surplus will end the summer cooling season at relatively low levels going into the fall quiet period and the winter high demand season. As we near the end of the week, West Texas Intermediate crude oil is sitting at a six-week high and Brent crude oil at an eight-week high. All of this is occurring not because a deal has been reached to freeze production, but because the world’s biggest producers are “preparing” to discuss a possible freeze in production levels. Talk about speculation. Before the market began its rally on August 3, there were reports showing that hedge funds were dominating the trade with record short positions. Now, we have strong evidence that these funds are paying anything to cover their positions, driving up prices. I wonder what the charts will look like when the hedge funds decide to shift to the long side?